Flush-Roulette® is a FAST-ROULETTE Game. 1. Player selects a Numbers plus a Suit-Symbol (Spade, Heart, Club or Diamond) on the Roulette layout. 2. Player wins 105-to-1, if the ball lands on his selected number and both randomly selected Symbols match his Wagered-suit (Roulette-Flush). 3. 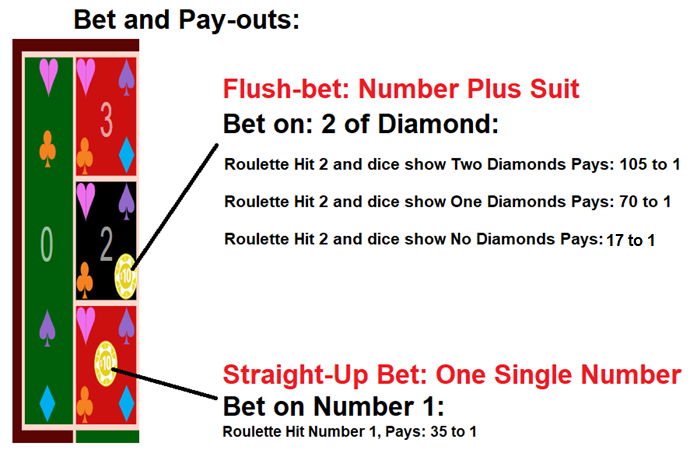 Player wins 70-to-1, if the ball lands on his selected number and just one of the randomly selected Symbols match his Wagered-suit (Roulette-Suit). 4. Player wins 17-to-1, if the ball lands on his selected number, but neither of the randomly selected Symbols match his Wagered-suit (Roulette-Hit). 5. Player loses his wager, if the ball doesn’t land on his selected number.